Chard grows in vertical racks under LEDs at the Bright Agrotech warehouse in Laramie, Wyo. There are few places where the connection between energy and food is more obvious than at the Bright Agrotech warehouse in Laramie, Wyo. Most of the building is filled floor to ceiling with giant shelves of cardboard boxes and tubing — equipment Bright Agrotech sells to farmers — but in one corner of the warehouse, there’s a small farm: rows and rows of greens and herbs, growing in white vertical towers under dozens of bright LEDs. The hum of electricity is palpable. “We’re always thinking about energy, because it costs us money,” Bright Agrotech CEO Nate Storey explained. Conventional farmers also pay for energy — for fuel to run their tractors, electricity for irrigation and fertilizers made from natural gas. But the energy inputs are more quantifiable here, in this brightly lit warehouse: electricity comes in, food goes out. 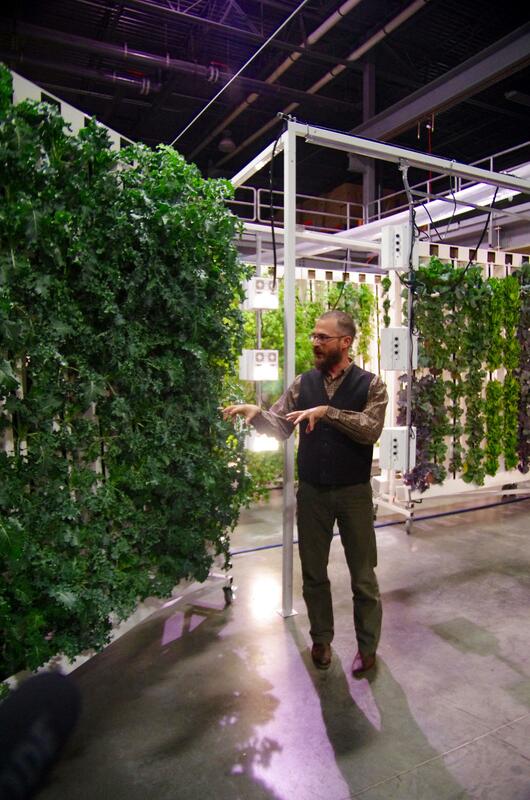 Bright Agrotech CEO Nate Storey demonstrates how indoor vertical farming works in the company's Laramie warehouse. Up to a fifth of our nation’s total energy use goes into growing, transporting, processing and eventually preparing our food, but those energy inputs are often hidden. In Bright Agrotech’s case, the kale and microgreens and edible flowers are a direct product of coal, which supplies most of Wyoming’s electricity. Burning coal to grow food isn’t as green as Storey would like it to be, but he points out fossil fuels are hidden throughout the food supply chain: from the trucks that carry produce thousands of miles across the country, to the plastic packaging and refrigerated coolers in the grocery store. “We’ve got this incredibly huge industrial complex surrounding the production of the things that we eat,” Storey said. Huge and growing. One of the few studies to look at all the energy inputs into our food system shows between 1997 and 2002, food-related energy consumption grew six times faster than overall energy consumption. But it wasn’t farms like Storey’s that drove most of that change — instead, it was the often-forgotten steps in between a grower and one’s dinner plate, like food processing. “Instead of, for example, buying a head of lettuce, taking it home, cleaning it, cutting it, you’re paying a processor to cut it, to clean it, to bag it and then all you have to do it open it, put it in a bowl and eat it,” U.S. Department of Agriculture economist and report author Pat Canning explained. But the biggest energy consumer of all is also the most hidden: our own kitchens. “Really each home kitchen is a small restaurant, with a very specific clientele,” Canning said. Estimates vary, but approximately one third of all the energy we use to produce food is consumed in our homes — by the hundreds of millions of stoves, ovens, dishwashers, microwaves, blenders and extra freezers. In effect, in our modern food chain, we've replaced human labor with energy-guzzling machines, which means as we head into this season of eating, we can expect to burn a lot more fossil fuels to fuel our feasts.